1. Gather your material. 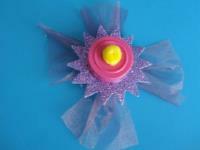 You will need a foam flower shape, pink and/or purple pipe cleaners, scraps of green foam, a small plastic lid, a pompom, white glue and/or hot glue, tulle, pretty ribbon, and scissors. 2. 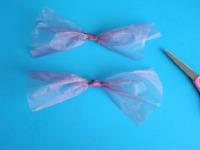 Cut two pieces of tulle and make a knot in the centre of each one as shown. 3. 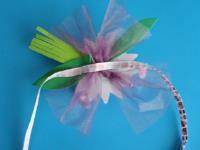 Glue the two bows under the foam flower, one horizontally and one vertically. 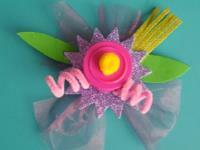 Glue the plastic lid in the centre of the flower and add the pompom in the centre of the lid. 4. 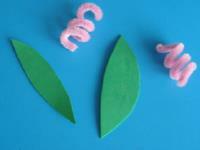 Cut two leaf shapes out of the green foam. 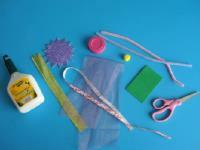 Cut the pipe cleaners in two and wrap each piece around a crayon to represent pistils. 5. Glue the pistils and the leaves around the flower to complete your Mother's Day corsage. 6. 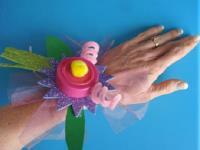 Use hot glue to attach the ribbon under the corsage. Children will be so proud to tie it around their mother's wrist.